I hope you enjoy this little fabric box tutorial as much as I do. It is simple enough to complete in about an hour, which makes it perfect for a last minute hostess gift. Fill it with candy and you are ready to go! A friend gave me the pattern* a couple of years ago, but after I made the first sample, I lost the pattern! Luckily, I remembered what to do, and wrote up my own instructions. There was no indication of who had designed it, so if you know whose pattern this is, please do let me know. I haven't seen anything else like it online. *The original was a one page, hand drawn pattern that looked like it had been photocopied a number of times. I interpreted the pattern in a completely different way from my friend. (2) squares of fabric, between 8" and 12". My sample was made with 10" squares. A piece of batting the same size as the fabric (or a little bigger). A walking foot, if you have one. Step 1: Layer the fabric, right sides together, on top of the batting. 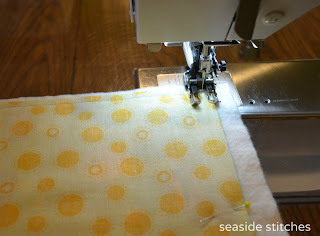 Step 2: Stitch 1/4" seam around perimeter, leaving an opening of about 4" on one side. Step 3: Trim away the batting from the seam allowances to reduce bulk. 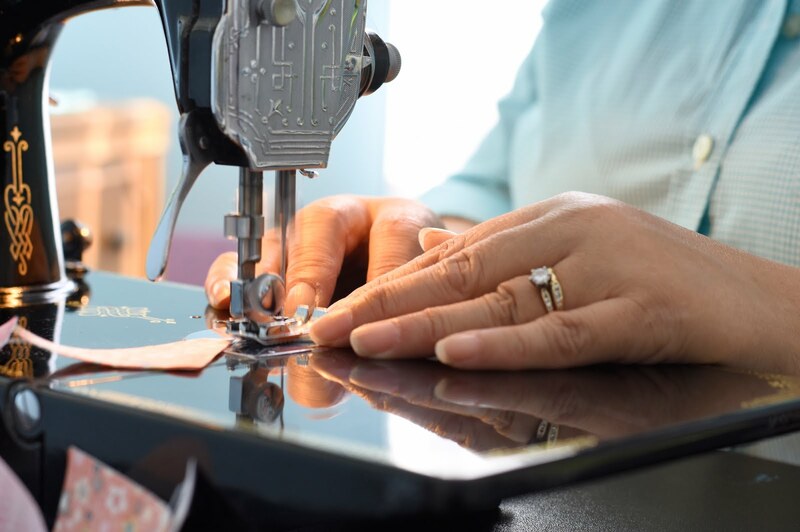 Trim as close to the stitching line as you can without clipping into it! Step 4: Turn right side out and press. Step 5: Top stitch close to the edge, closing the opening as you go. ... until my bobbin ran out! 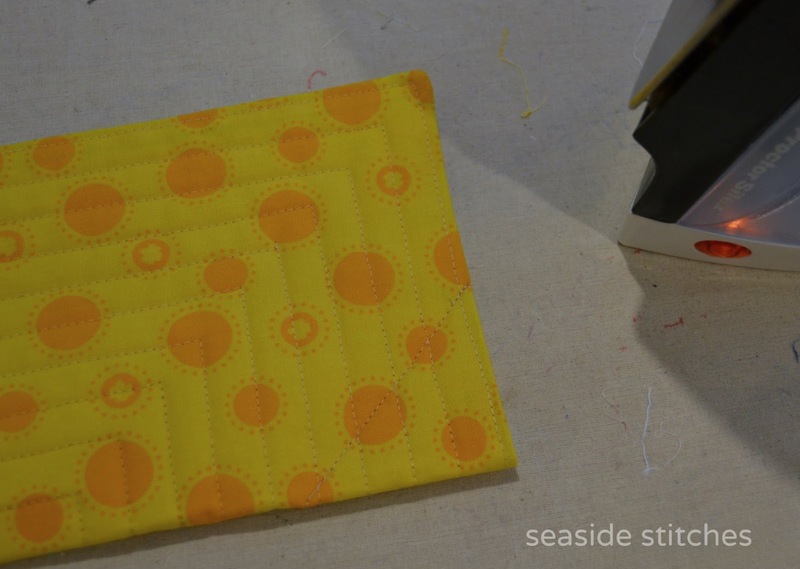 Step 7: Fold the quilted square in half, right side in. Mark a 2" triangle in the corners. 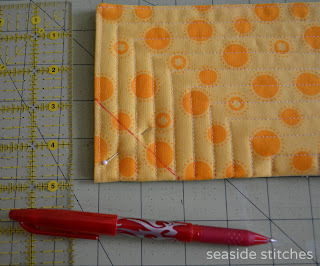 Stitch the 2 bottom corners, back-tacking at the beginning and end. Since I had used a Frixion pen for marking, I just needed to hit it with an iron to erase the line! 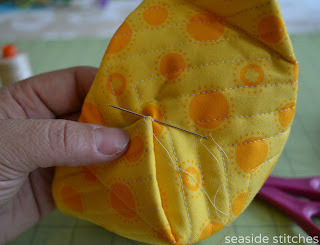 Step 8: Open it up and fold it in the other direction, marking and stitching the remaining 2 corners. Step 9: Turn the box right side out. ... and the inside flaps tacked down. 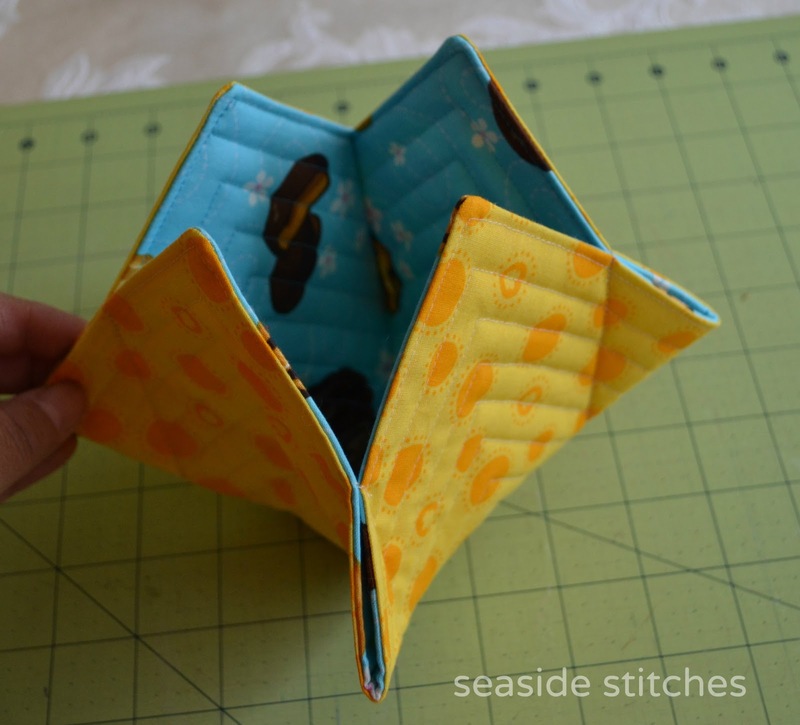 If you would like to eliminate the inside flaps, try Connie's modification with French Seams! Step 11: Stitch on some cute buttons, if desired. Starting with 10" squares, the boxes finish at about 4" x 4" x 3" high. My original sample was made with Meadowsweet leftovers. I still love that collection so much! And this is the one I made last weekend for Barbara. 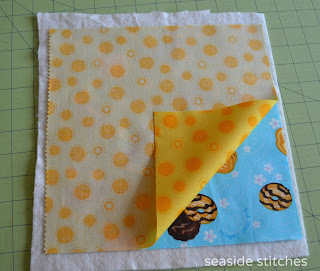 This one started with a 12" square, so I made the sides a little higher (2.5" corners in step 7). Have fun with the tutorial and let me know if you make one! 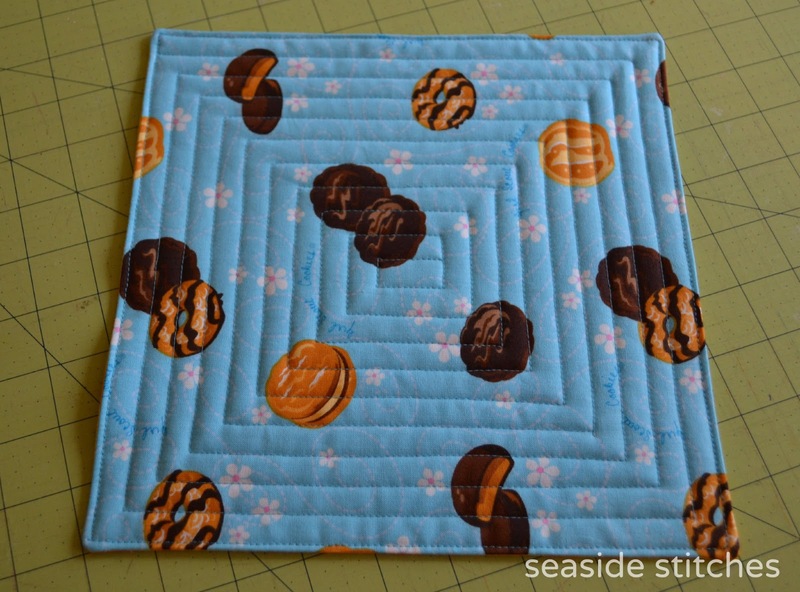 Edit 4/13/14: I am not affiliated in any way with the pattern being sold on Craftsy for $6. Edit 5/22/14 for clarification: The pattern I was given did not include any authorship information, or I would have given credit from the start. There were just a few hand drawn diagrams and cryptic text open for interpretation. It was not a copy of the pattern being sold on Craftsy. I wish there was a name on the original drawing, but there was not. I struggled with offering it online, but I felt my finished product was more detailed and my instructions were much clearer. 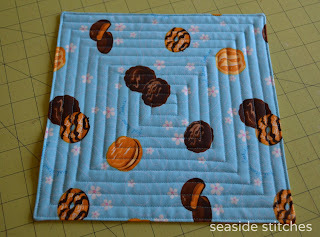 I added the quilting and the buttons that were not included in the original. 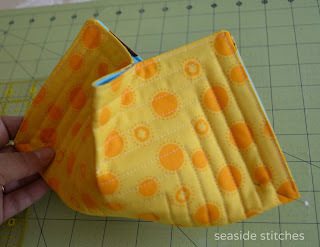 The pattern on Craftsy was not offered until after I had posted my free tutorial. I believe the designer used the ideas that I had fleshed out. If she used her own photos and text, there is no copyright infringement. I haven't purchased it, so I don't know that to be true. She claims there are design differences, but her sample in the Craftsy listing looks just like mine. It is even quilted the same way. I don't believe she is the designer of the pattern I was given many years ago. Because the basis for this fabric box was not my original idea, I struggled with offering the tutorial at all. I did not feel it was right to profit from it by selling the pattern. Again, I wish the person who drew the original diagrams by hand had signed her work. It is in the spirit of sharing that I offer this free tutorial. They look great filled with candy or a small potted plant. You may use it as a guild or sewing bee project. You may make them to sell for charity fundraisers. If you make them to sell for personal gain, please drop me an email. 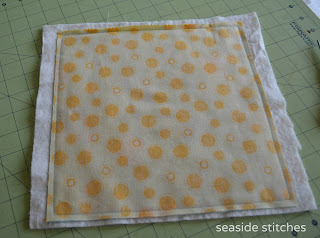 Visit my Pinterst board to see how other sewists are interpreting this project. I love this box, thanks for the tute! It's neat and cute! Thanks for sharing. I also love the blue buttons on first pictures! That is a really sweet box and a great idea for a last minute gift box. I'll definitely be making this. Very cute! thanks! They are so cute. Thanks for the tutorial.Think one of these will be on my list for something small towork on this weekend. That's as cute as can be! Thanks. Thank you so much for this tutorial. I love this box. Could you please give me the dimensions of the finished box using the 10" squares? It is too cute. I just made mine following your tutorial, super easy. It took me longer to find 4 matching buttons than to do the sewing. I'm going to make a couple more for my girls when they come for Easter. Thanks so much for sharing. I love this! I'm making them for my teenage granddaughters for Easter. This is delightful and I thank you for sharing the how-to. These are so cute! I made one for my grandson tonight and I'll finish the one for my granddaughter tomorrow. Thanks so much for the tutorial! So cute! Great for notions! Thanks for the tutorial! Thank you for sharing this great tutorial with us. This is just so cute! Thanks so much for showing us how. So cute & so verstaile. Thanks - very clear instructions. Adorable! I must make one. Thanks for the instructions. This is soooo cute and look like they'd be quick to make up if you were needing a last minute gift. Hi, I found your blog through Sew Many Ways, I love your tutorial. This is a nice project, that I will try!I hope you don't mind I pinned this project for future reference. New follower here via GFC. I hope that you will visite my blog and if you like my creations I invite you to follow me. Tina, thank you for this great tutorial. 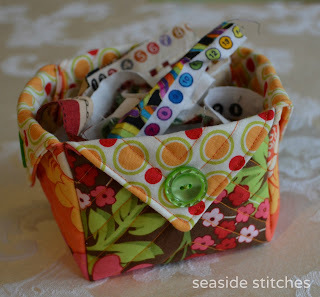 I posted a link for your site on my blog with pictures of my little fabric box. Went together so easy. Thanks again! Thanks for the tutorial. It was a fun little project. Thanks for the pattern. I made one but changed Step 7. Instead of making a large dart, I made a "French" seam which encloses the seam and you do not have to tack town the dart. Your boxes are gorgeous! Great fabric choices! Thanks for sharing the tutorial. I'll definitely have to make some of my own one day soon! I made this basket using the 12" sq. I then put a small potted plant in it and gave it to a friend. I plan on making more and filling with goodies to give as door prices at our womens conference. Thank you for this pattern for it has endless possibilities. Love it - thanks for sharing. Great tute! Great tutorial and beautiful Blog.I´m follower now. What a pretty and very usefull box, I love it! Oh goodness! You have saved my toast! ;) My daughter asked me to make her a few (meaning about 20! )gifts to give to all her UK friends (she has been living there for 3 years and will be leaving next year)this Christmas and your little box is perfect! I can't wait to get started! Hi Tina. Thanks so much for the tutorial. So easy and quick to make. I've just posted the one I made to my blog if you'd like to take a look and now have another three cut out. These are addictive. Thank you for sharing. I'm going to make one today so I don't forget. Too cute. Fell in love with this tutorial, tried it out straight away! Turned out beautiful...used same fabric in and out, will use different ones next time! Thanks for the great idea. 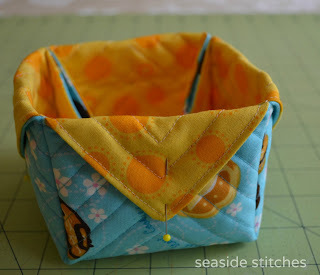 Just edited my post to add photos of the second bigger box that I sewed too! Thanks for the tutorial! I've made my first one & posted a link in my blog back to you. Oh this is just too cute. I think I have to try to make one. Thanks for sharing. I LOVE THIS I Can't wait to make one. THANK YOU! finished mine today! I love it! Thank you so much for the tutorial. Done it! Great tutorial, the only thing was at first I tacked down the inside flaps in sequence going round and they need to be pointing at each other to make the nice box shape. This once again proves that if I can do it wrong....! I love the size for dropping in thread, just right - you can't miss. Thank You. Sew very cute. I'll have to try real soon! Hola!! a través del blog de una amiga e visto tu blog es muy bonito!! y hacia tiempo que andaba buscando unas cestitas como estas has hecho son preciosas ! !mi blog es. Las Agujas de Alicia . And I found your nice blogg and liked it very much. Now I have made a box that I have seen on your blogg 28 march 2013. It was fun to make this two boxes, I think. Thank you for letting me know how to do! Today I show them on my blogg. Let you know if I make one??? I've made at least a dozen! I'm addicted, and still counting! Thank you! I was just trying to think of some quick gifts to make before leaving on a trip, and here you are! Beautifully done tutorial, very clear instructions, and a lovely result. Thanks so much for posting this. Thank you so much for sharing. 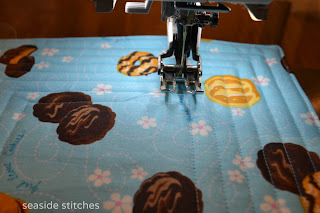 I am a new quilter and battle to follow instructions, but you have pictures too so I can follow. Thank you so very much. I am looking forward to making this one and will post a photo when I am done. These are darling. I use something similar... and the little slots left by tacking down the inside flaps work great for standing up make up brushes, lip lines, etc. & the larger items can go in the baskets. Great for traveling. Thanks. Great idea and tutorial, thanks for sharing. I read it at the proper time to make 2 dozen of boxes, and present them filled with miniature colored marshmallows as gifts for my guests at my birthday party. It was a success! They seemed children in a candy store, choosing which one they liked more. I left some of the boxes with the corners up, not folded nor buttoned, some fabrics showed better this way, and some of my guests liked them more this way. Tina, I need to teach something at my quilt guild in February.....I would like to teach making these adorable fabric boxes. Would you have a problem if I used your tutorial in doing so. I would certainly give you credit for the tute. OMG...I showed my daughter this, just this morning and two hours later we each had two!...she said she was going to make one for her txgiving dinner and put velcro instead of buttons and and keep her dinner rolls warm...then just flap open to serve! Thanks for sharing...you wonderful creative people! These are absolutely adorable. I made two today and can't wait to make more for gifts. What a great little tutorial. Thank you for posting. Thank you for this tutorial. I found it on Pinterest yesterday and made it today. Fast and fun! I love these baskets. I've made 9 so far, six tonight. Thanks for the tutorial! What a nice basket. I have done two basket in 1,5 hours, a really fast project. Great tutorial. Thanks for sharing. I saw someone's post who had made this fabric box to fit the small. fat box of kleenex, (not the rectangle one), but i can't find the post with the dimensions for the squares of fabric. I think it was 15", but am not sure. I would also like to know how far back to stitch the corners. Thanks for your help. Loved your tutorial, it was so easy to follow. I finished my project in about an hour and it turned out great. It's a gift for a friend of mine that went to Penn State. And I linked to your tutorial, hope you don't mind! Greetings from South East Asia. Thank you for sharing this adorable project. It will make a great gift for any occasion. I made it about 35x35"and it became a great basket for all my crochet! LOVE this box. They ARE addictive! Just found this pattern and here I am last minute trying to make one for everyone I know for Christmas. A suggestion to make it even quicker. Use fusible batting and cut a 9 1/2" square for 10" fabric squares. Fuse to the outside piece. 1/4" seams will be outside the batting so no cutting it back before turning and makes for a less bulky edge. Fusible batting also works better when quilting if you do not have a walking foot. What a great tutorial!! I have made several of them and blogged about them today. Thanks! I know what I'm going to make for my girlfriend for Christmas now! Thanks for sharing. Finished my little box in about 15 minutes. Used 12X12, 20X20. They turned out really cute. Christmas fabric's for gifts. A friend of my made some beautiful Gift Boxes for her craft friends and also kindly sent me the link to your Gift Boxes tutorial. My son & I have fallen in love the her gift and I would like to make for him and his wife. Please could you let me what size batting/wadding you have used for the this boxes. Thank you the brilliant idea and also for creating the tutorial. too cute, wish I had seen this before my Christmas exchange! I'm making one now. Thanks! So this is an awesome mini project and I tried to follow along, but i got lost somewhere...:-( gonna try again and see if I get a clue lol...really awesome. Thanks for sharing this tutorial. Adorei. Obrigada por nos ensinar coisas tão criativas e úteis. Feel like such an idiot ughhhh i finally figured it out! cute boxes in progress!!!! Nice idea for some quick storage boxes. I just made 2 of these little boxes today in less than 2 hours. Gonna make nice gifts. Thanks for the tutorial, I will give them a go tomorrow..... terrific and simple. 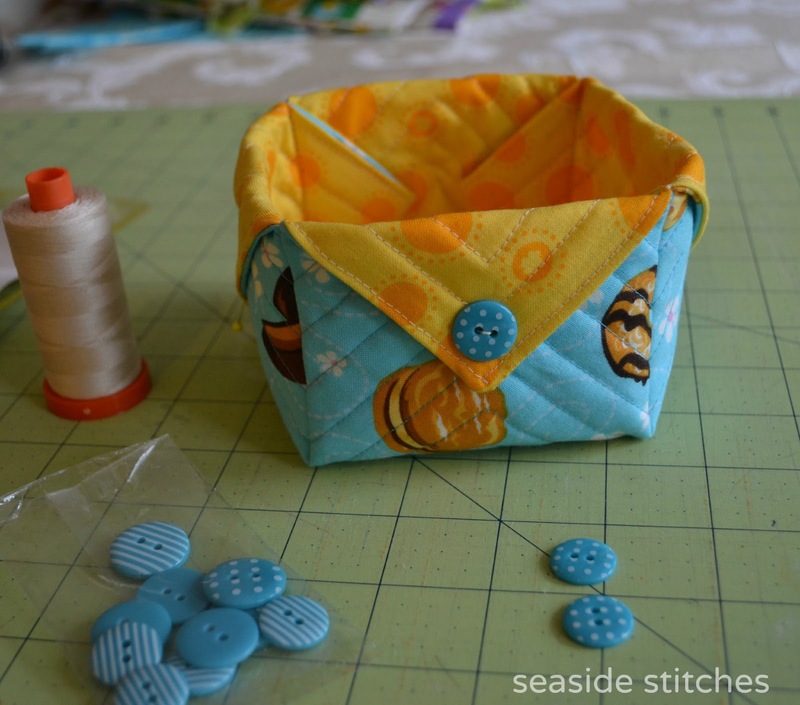 I just saw these cute storage boxes on "Quilt to the Edge" and love 'em! thank you so much for this tutorial. I love those boxes. what a neat idea. I have many uses for them already. Very clever. I am definitely going to make a few. 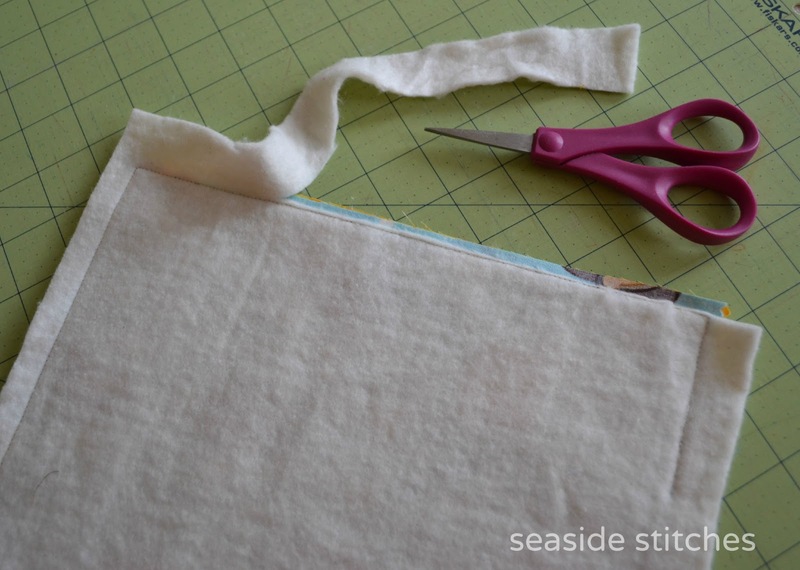 I have seen a similar idea, but you use fusible fleece and you make the triangle pleats from each fabric before you sew them together. Apply fleece to outside fabric and quilt as desired. 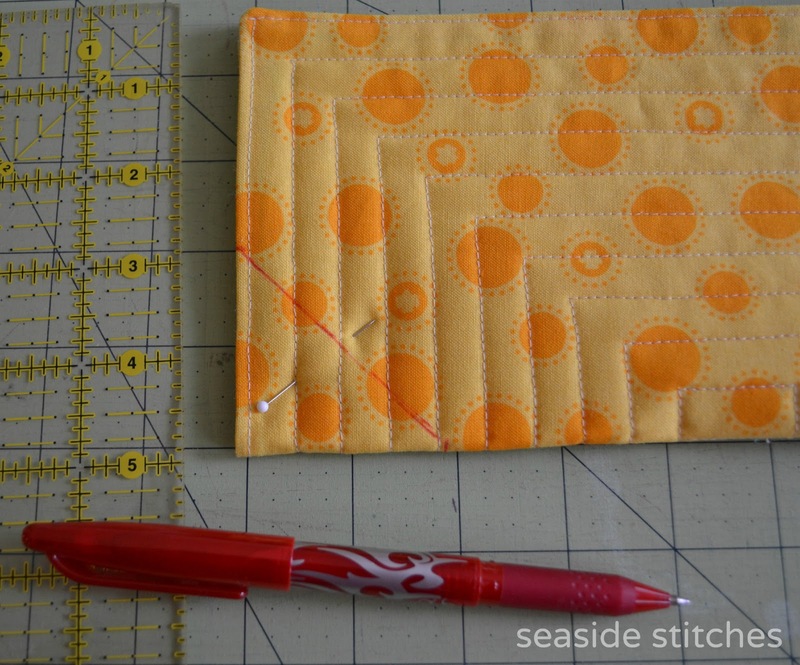 Make the pleats as described in this tutorial, oonce for the quilted outer piece and once for the lining. You will get two "bowl shaped" pieces when done. Then, layer the two resulting "bowls" rst and sew around, leaving an opening to turn. It sounds tricky but it really isn't. The difference is that the little triangles will no longer be on the inside of the finished box. I did some this way for Christmas and then gave them to people with bags of wrapped Christmas candy. Thanks for the tutorial and lovely pictures. Well, I found this through Pinterest, gave it a whirl last eve. I like it very much, and see a few more in my future! Thanks for sharing! Made a bunch for Christmas and filled with cookies and treats, they were a huge hit. I did not let on, how easy they were to make! Thanks for taking the time to make me look like I am brilliant. I make three before the NFL football playoff games Saturday morning! So easy! Did the little bit of hand sewing while watching the game, then used them for my hand applique "stuff" for the rest of the games. I used my 12-/12", 9-1/2" and 6-1/2" square-ups to cut the squares. They all next into each other perfect! Thank you for posting such a wonderful tutorial! Love it! Here are photos of the three nested boxes I made as mentioned in the previous post. The medium one (9-1/2" square-up) has the wings on the outside rather than inside. I wanted a small "trash" box so didn't want the wings in the way. I shared your tutorial link with a friend today, these boxes are a hit! This was fun fast and easy to make. Thanks for sharing. Just made this box with 9" squares in a couple of hours! this is so cute and a quick give away... I´ll try and take the first one for me! Thanks so much, I have been looking for such a little box to do some sweats into for my sweing table! Looks like it could be a napkin holder! This is so cute! Thanks for sharing this pattern! Lovely boxes and a beautiful tutorial. I don't sew but I am definitely going to try this. Thank you very much. Love from India. Hi, your blog are amazing! I loved! Linda Johansen's book "Fast, Fun & Easy Fabric Boxes" in 2004 is was I believe the original book on this. I made many boxes from her pattern. She also incudes lids in her patterns. I'm sure it's still in print n Amazon. She also had them in many shapes, including a cool oriental style "go box"! They are soo much fun! Your tute is great. Great easy gift! thanks for the tutorial. Thank you so much for sharing your tutorial. I made several boxes for gifts. Very good directions and FUN to make. Made my first fabric box today.. took 4 hours. Next one will take half as long. Gave it to dear friend for her birthday tonight... she liked it.. big time! Hi Tina, we made the little quilted boxes at quilt guild yesterday. Everyone had a great time!!! I posted photos on my blog!!! Hi Tina. Nice to see your tutorial for this smart looking little box is still doing the rounds. Thanks for sharing. 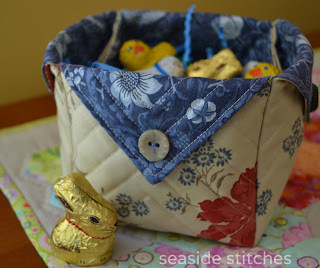 A great craft idea and just in time for Easter (again). Awesome! I'll try it for sure. Very good tutorial. I made five during one afternoon. Thank you. Hi Tina can I recommend your tutorial for someone to use in a group project for this Sat. Her facebook page is: https://www.facebook.com/profile.php?id=100008102313232 called Quilt Findz. Will made sure she links back to you. Adorable!!! I will be making this pattern for my granddaughters for Easter. Thank you! I hopped over from http://quiltinanotshell.blogspot.com/2014/04/fabric-box-4.html. These boxes are so adorable and love the little blue buttons. I love this and thank you for the wonderful tutorial. I am your newest follower and would love to invite you over to visit and maybe even follow me back. I'm retired and enjoying being an at home wife. Life is good. I blog about my many interests sewing, quilting, painting, re-do furniture, crafting, and being a grandma. I love making new blogging friends and following all their creative blogs. We had fun posting pictures all day that day. Hi Im wondering if you are aware that this wonderful little project has been placed on craftsy.com as a paid pattern. $6 If you are not the person who posted it can you contact craftsy.com and alert them? I found your instructions easy and have since made one for myself. Except I used little butterflies instead of buttons, reason I didnt have any buttons of that colour. Thanks for sharing your pattern with others. Thanks for te tutorial. I love these boxes they are so cute. Love these little boxes, thanks so much for the so easy tutorial! I just finished my little boxes. thanks so much for the tutorial! How do I get the mug rug and basket? Or is this it??? It could be a very cute mug rug!!!! Made one today. Now all I have to do is find those buttons! They're stored safely in the quilting studio! :-) Thanks for the tutorial. I'll have to make a few more. What a great way to use up some odds and ends of fabric. We are making these for the church bazaar for fund raising, they are so very sweet. Hi Tina, Just had to give you up date of FaceBook page: Quick Quilt Saturday (https://www.facebook.com/groups/quickquiltsaturday/) The ladies love the tutorial so much they are still making them. We make two so we have a mug rug also to go with the basket. We have enjoy your tutorial. Just made the first of many to follow. Sew cute, so simple. Thank you so much! Thank you Tina, for the tutorial, I love it. Maricea. Your directions were super. Thank you! I had a lot of fun making this. Thanks for sharing. It came out beautifully. What size triangle do u suggest for the different sizes ? Or is is just trial and error? That is SOO CUTE.thanks for sharing and being so honest about the pattern. I look forward to using your info.. Thank you for sharing this Tina, the instructions are so clear. I have just made one and posted pictures of it on my blog connectedquiltersblog.blogspot.co.uk with a link to your page. I hope that's ok with you. I just made one, and you are right it is so easy to make. What about doing a 14'? what do you think the corner triangles would be then? I made one at my sewing class recently, it was so successful I have made a further two this afternoon to put on a craft stall at my local church flower festival. 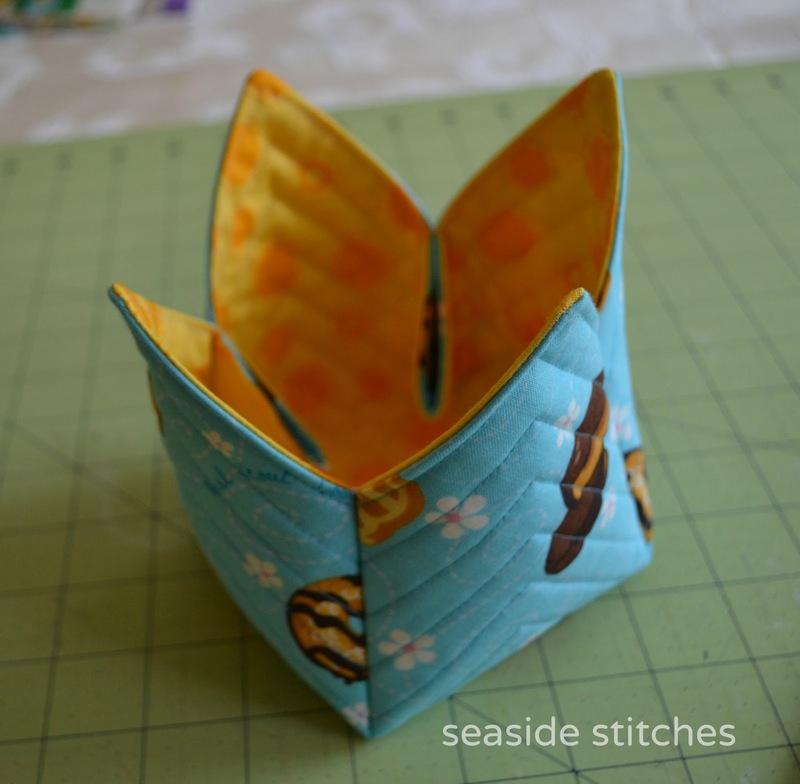 Thank you for sharing this lovely pattern and your tutorial. Hi Tina - gorgeous boxes and excellent instructions - made my first box 'practice piece' last night. Today the sewing starts in earnest for our 'Samaritans' branch 50th anniversary charity fund raising event later in July. 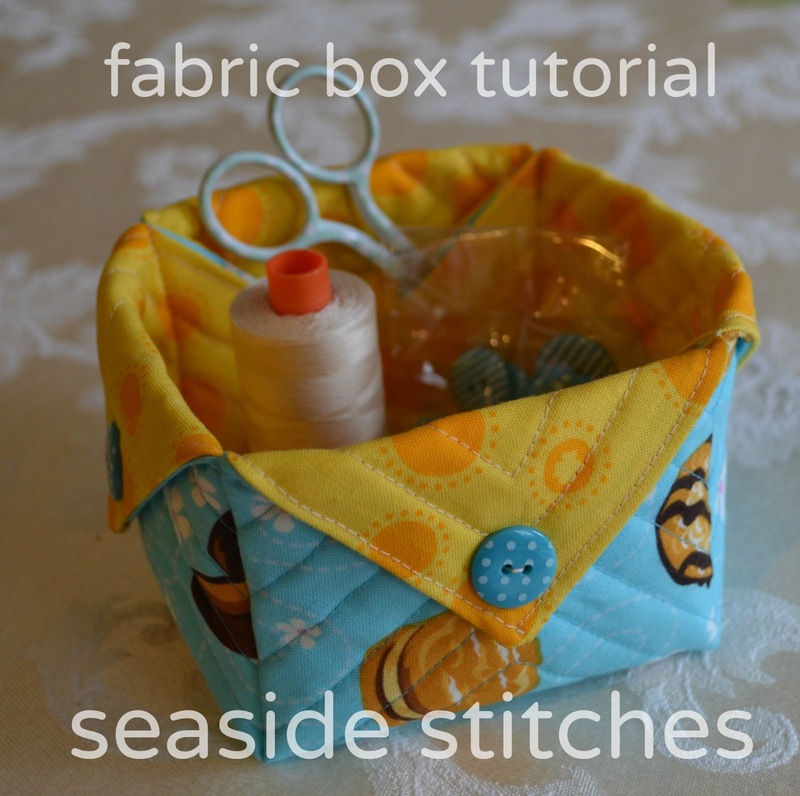 Your lovely fabric boxes will be a great addition to the handcrafts stall. Thank you, from a Norfolk broad (UK). a few friends and I Loved this tutorial and had a great time doing it and have blog you with full credit. THANKS SO MUCH!!!!!!!!! Here is the post with completed project pictures. to your great blog thank you!. This is awesome and so so cute. I can see this on my sewing table and my card making table. Thank you so much for sharing. The fabric box is adorable! I have tried several times and cannot print nor download the tutorial. Is there a way I can get this pattern? Just made this tonight-took a little over an hour start to finish. Probably less if I hadn't been hunting down fabric and buttons. I did the 10 inch, bought post it notes to go in it (and some candy). Have had this pinned forever, fun to finally do. Thanks for an awesome tutorial. Just made this this afternoon and think it is precious. 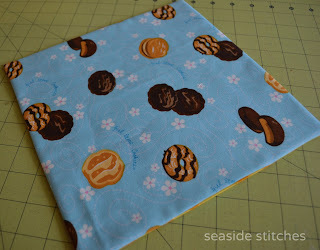 I plan to make several more in Christmas fabric to fill with cookies for gifts. Thank you for sharing from your happy heart! love the pattern.. must give it a try. I am going to give it a try. I just love tge pattern and of the fabric. This is just what I've been looking for. Needed a quick project to teach our Keepers of the Faith group some quilting techniques. These girls range in age from 5-11. I will send you a picture of their finished projects. Thanks so much for sharing!! the instructions were so easy. Thank you. I put a magnetic pin box in the bottom and drop my pins in it. It works for me. Thank you for the posting. Thank you for this tutorial! I love making little stuff! This is going to get used often! 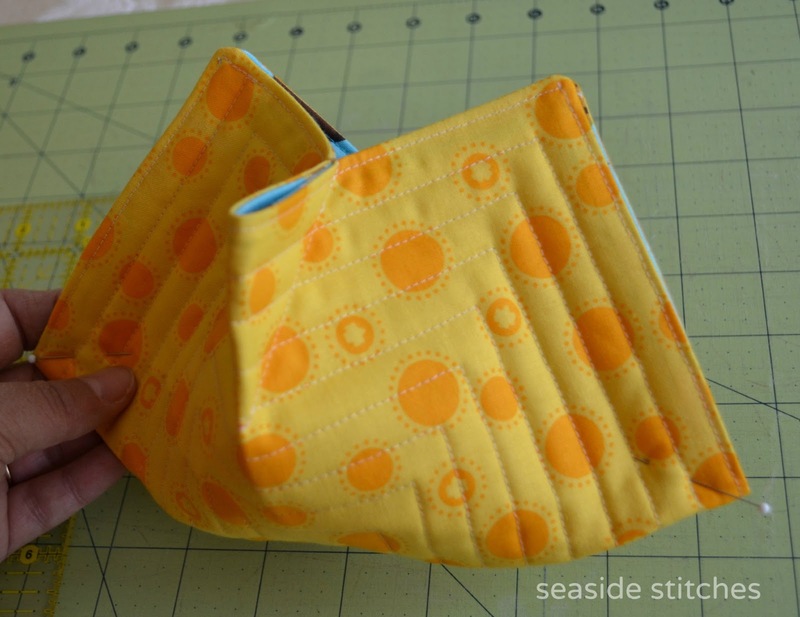 Thank you for explaining the difference between your tutorial and the pattern on Craftsy! I am in total agreement with you; and you gave the fair acknowledgment as much as you could. Hopefully the other person is being as fair as you are! This is supposed to be fun. There's a HUGE nasty battle going on with some bags; Sew Demented lives up to her name. thank you for doing this. I appreciate your honesty, and found your directions and pix very well done. Hope you have a great holiday season; I will be make lots of these! Lovely tutorial. I must be such a slow coach as it takes me more than an hour! I will be trying out an oblong one for pens and pencils for my grandchildren. Wish me luck, I may be gone some time! Just finished my first one. So easy. Love this. Thank you. I just made my first one although I copied your pattern about a year ago. I will be selling these at a craft fair about 2 weeks from now. I will let you know how they sold. Just made my first one and it is so easy. Love them. Thank you for the wonderful tutorial. I think these are the cutest fabric boxes I've ever seen! I will definitely make some to keep some stuff organised. Thanks for sharing this tutorial. I made a blog post linking to your tutorial, you can see it here. Thanks for the easy to follow tutorial! I have made fabric coasters that fit perfectly in the fabric basket. I have listed them on my etsy @myhousekeygoods if you would like to take a look. Thanks again! Thanks for the tutorial. 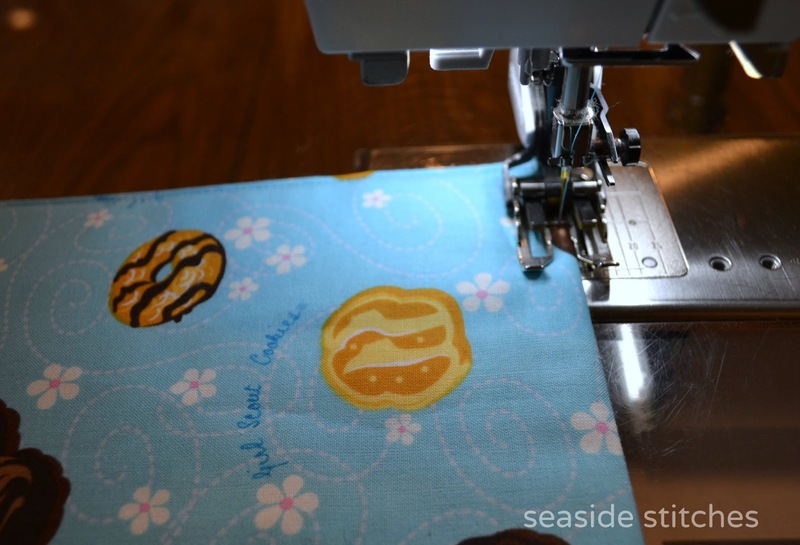 I am always looking for FREE patterns that I could possibly sell the completed product for my profit. This is really the 1st one I've found. I love boxes and may keep them all! Thank you for sharing! Thanks for the free tute! So cute. 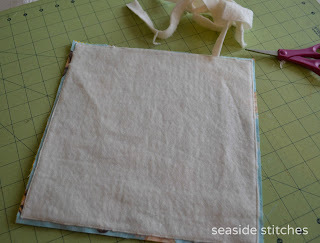 Yes, people are scouring the internet to find free tutes, and then monetizing them on Craftsy. Some are honest about it, using the original as inspiration, and changing something - and actually drawing a whole new pattern. 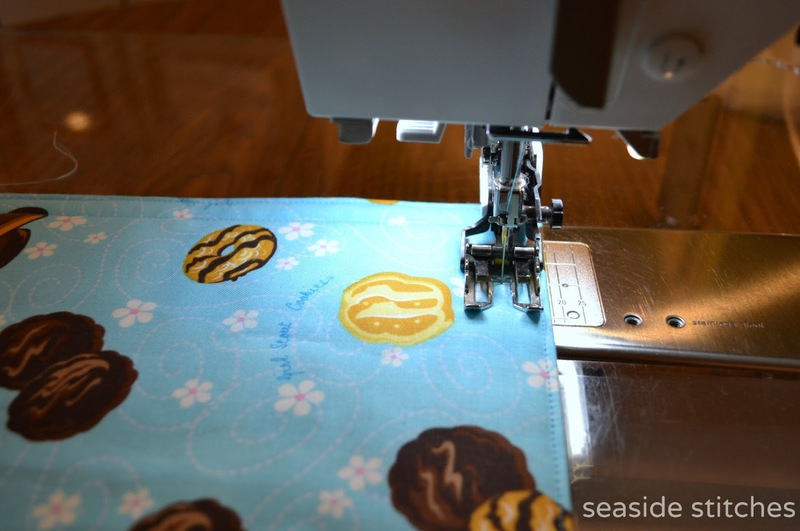 Some are simply copying a free tutorial pattern exactly, line by line, and have made tons of money this way. I agree with another poster, Sew Demented does indeed deserve her name. There is no copyright on design, period. Thank you for sharing your knowledge with others. It makes the community richer. I will try the box/basket I think it has many uses for gifts and to keep. With the size fabric you listed, what size does the box end up to be? Thanks for the cute share! Thanks for this tutorial. I saw one in the past were the flaps were left un-sewn as it was being used for a sewing box and scissors/tools etc were put into the inner 'pouches/flaps'. Just saw these at our guild luncheon with plants in them. So clever. will make these for my home and gifts. Thank you to you for posting the tutorial. Thank you also to the original designer. I am sorry that you did not get credit. To the individual that is selling this designs...Shame on you. What is the finished size of this fabric box with the 10" square? Just darling!!!! I just saw your tutorial, thank you so much. It is very clear and easy to follow. I love all the colors in the boxes you made. Now to go thru my stash and start creating. Again, thank you soooo much for the inspiration and tutorial. I have made these boxes before from a free tutorial on YouTube . They are very handy to have around and make great gifts. I think it is great that you offer it for free and took the time to not only write it out but to post such well taken photos that it makes it very clear to follow. You have given me new inspiration to make a few more. I want to quilt it as you have. I did hash tag design on mine. I think I will make some smaller ones and use buttons or small flowers to embellish them. Shame on others that profit by selling others patterns. You have the right spirit ! Passing on old patterns is always a good thing. Hi! 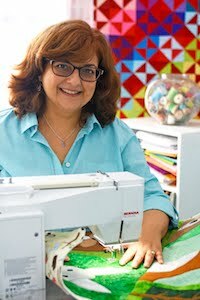 I'm Tina and I love to quilt! Visit my feed to see what I'm up to.